Great Brickhill moved up to third in Cherwell League Division 1 after a nail-biter at Abingdon Vale on Saturday. Batting first, Abingdon lost wickets at regular intervals thanks to some tidy Brickhill bowling, in particular from Garth Davson (5-27) and James Wagg (2-22), with Jack Woodhouse (1-9 from 8 overs) continuing to prove a handful in the middle overs. Abingdon’s 191 looked well below par and Brickhill looked to be cruising to a crushing victory as Mark Nelson (37), Arjun Jhala (34), and Doug Aris (25) laid the foundations for a useful away win. However Brickhill lost a flurry of wickets as the chase floundered and it was left to the last wicket pair of Drew Burrows (19*) and James Wagg (4*) to knock off the final ten runs. In Division 3, Great Brickhill 2nds remain bottom after losing to Oxford Downs 2nds. The home side made a strong start, openers Luke Lathwell (19) and Jilesh Pattni (59) putting on 50 for the first wicket and, with support from Asif Khan (26), guiding Brickhill to a solid 104-2 at the mid-point. 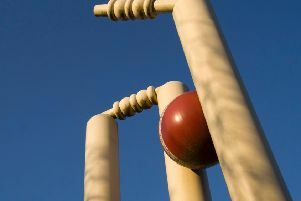 However the middle order was kept in check by effective Oxford slow bowling and the home side lost wickets regularly as they attempted to accelerate. Ahad Khan (37) again played an important role in the latter part of the day, shepherding the team to 181 all out. 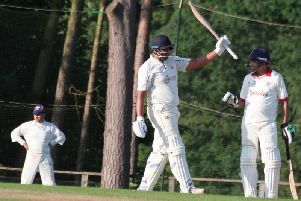 In reply, Oxford Downs chose to accumulate rather than hit their way to victory and the teams remained neck-and-neck into the latter part of the innings. Brickhill took four quick wickets to leave Oxford on 120-6, Ahad Khan (4-39), Razzan Anveer (1-30) and Ed Marshall (1-26) taking wickets at key moments. In the end, though, the visitors made it home with seven balls to spare in an exciting finish at Horsepond.